20" and 24" ROTARY MOWERS. Deep housing completely shields blade for safety. Close coupled for better cutting over rough ground -- avoids "scalping" Trims within 1" of fences and walls, trims under hedges. Use 20" Mower 990019 with "L" and "V" series tractors. Use 24" Mower 990020 with "V" series only. Use 24" Mower 990192 with "W" series only. Specifications... Mower blade: 20" and 24" high carbon steel. Cutting height: adjustable from 1-3/4" to 4". Wheels: 8" x 1-3/4", with semi-pneumatic tires. Ship ping weight: 20" -- 50 lbs. ; 24''-- 65 lbs. 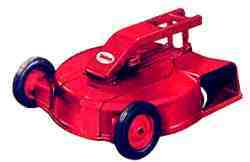 30" REEL LAWN MOWER (Mfr. No. 990058). Engine-driven cutting reel and independent clutch. Rigid cutting bar has simple positioning adjustment for underknife. All mowers are belt-driven. 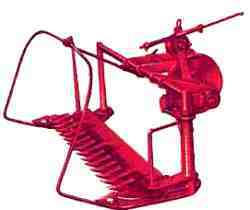 Use with all Simplicity two wheel tractors. Specifications ... Width of cut: 30". Height of cut: 1/2" to 1-1/4". Cutting reel: 5 heat-treated blades. Precision ball bearings. Shipping weight: 105 lbs. 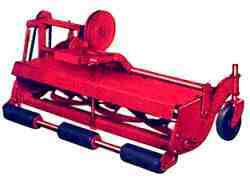 TWO-GANG COMPANION MOWER (Mfr. No. 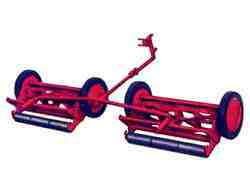 990198) Two 20" heavy- duty ground-driven mowers with tractor hitch. Use with 30" front-mounted mowers; all Simplicity two wheel tractors. Specifications ... Total width of cut: 59" or 64'. Height of cut:1/2" to 21/2". Cutting reels: 2, each with 5 fully-tempered steel cutting blades. Reel bearings: precision ball bearings, double-shielded, grease- packed. Gauge rollers: 3 section, wood. Shipping weight: 126 lbs. 30" SICKLE BAR (Mfr. No. 990193) Cuts ahead of tractor, close to trees and fences on either side. Has separate clutch control. Entire unit precision made. Use with all Simplicity two wheel tractors. Specifications ... Capacity: 4 to 5 acres a day. Width of cut: 30". Width of sections: 2". Shipping weight: 62 lbs.